Also, I AM SO SORRY for the bad quality of her mane and tail. It was my first attempt and as her mane flows, I couldn't get an accurate illustration of it. However, I am going to be studying up on her while I work on my next vector! Celestia Cutie Mark provided by *BlackGryph0n! "Your highness, please tell me you got cake for me? Tia sure loves CAKE!" Hii! Can I use this to make a base? Can I use your art for bases? I'll credit you along with a link to the original art that I use. Is that alright with you? for one of my friends. This Is the perfect position!! 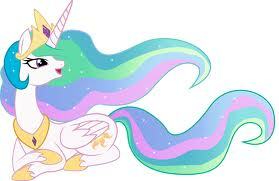 I used this as a reference to draw Celestia as I love this pose, however I've just realised I forgot to ask you. I hope this isn't a problem and it goes without saying you've been credited. I have worse anatomy than you haha! can I use thi sfor do a base?